This website is a non-official service which is owned and operated by Nationalinsurancenumber.co a private company. Our service fee ranges from £30.00 to £54.00. You are able to apply directly with the JobCentre plus and HMRC where there will be no service fee payable. We have No affiliations with any UK government body. Click here to find out why you should use us! You can apply for a National Insurance Number online. In order to apply for a National Insurance Number you must have valid photo ID and a UK address. A National Insurance Number is needed if you intend on working within the UK. You can request written confirmation of your number if you have lost or forgotten your number. Please note National Insurance Number cards have been replaced with an official HMRC letter. Apply online for your UK National Insurance Number. A National Insurance Number is a unique code used for purposes in the UK tax system. All applicants will have to attend an interview in which the information you have provided will be checked. Once you have applied, your application will be checked for errors and logged with the Job Centre Plus. An email containing your appointment details will arrive within 2 working days. Find a lost or forgotten National Insurance Number. National Insurance Number cards are no longer issued and have been replaced by an official HMRC letter. Your application will be physically checked for errors such as unknown addresses, spelling mistakes and more. Once checked you will receive your error free forms for you to sign and send to the HMRC in the prepaid envelope provided. If you are planning on working in the UK you will need to apply for a national insurance number. Your national insurance number will allow you to pay the correct amount of tax and national insurance contributions. Applicants must have the right to work in the UK in order to apply. The HM Revenue and Customs, as well as the Department for Work and Pension, will also ask you to state it when communicating with them via telephone or post. UK-Citizens who have lived in the UK since birth will get a national insurance number by their 16th birthday. If you have not received your number you can recover your number using our replacement service. You might not have received your original number for a number of reasons including a change of address without letting the HMRC know. This is dependant on your allocated job centre and how busy the Job Centres are. Applicants will generally get an appointment 1-2 weeks after applying. If you get accepted after your identity appointment it will take 3-6 weeks for your national insurance number to arrive in the post. You can work in the UK for up to 9 weeks while waiting for your NI Number. In order to receive a national insurance number for work purposes, you must attend an identity interview. Once you have applied via our service, we will check the information you have supplied us with. This is to confirm we have all the correct and required information in order to submit the application on your behalf. An appointment will be booked into the soonest available appointment at your closest allocated Job Centre. 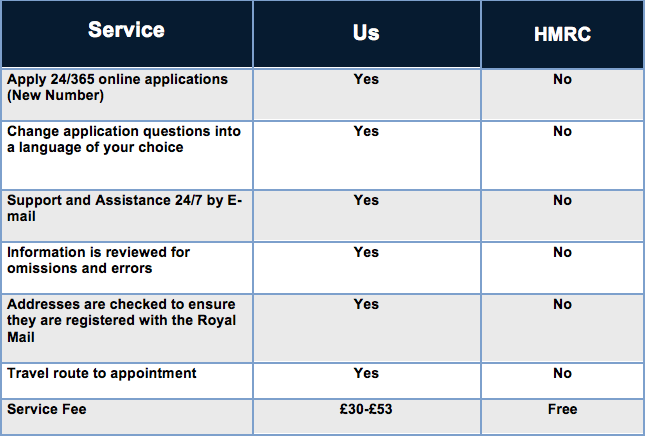 Once your appointment has been booked an email will be sent to the email address provided on the application form. The email will contain your appointment details and explain what documents you will need to take. 1. If you struggle to speak and understand english you might find it difficult to apply for NI number over the phone. We will apply on your behalf and re-book your appointments to best suit your needs and make sure there is a translator at your identity interview. 2. You can change our forms into 70+ different language's. 3. Email Support to answer your questions. Instead of waiting on a phone to get connected you can email us your questions (we typically reply in 1-2 hours). 4. Sometimes your appointment at your closest job centre won't be available or on a date that you need. We do all the waiting and phone calling. We will book you in at your closest job centre or wait for your desired date to become available ( Subject to availability ). 5. If you phoned up yourself (No fee is applied) you might not understand clearly what you will need to bring. Instead of calling back for information you have misplaced, forgotten or un-sure about we will be here to remind you. 6. You might not have the time to apply. You can apply 24/7 online which should only take minutes of your time. We do all the waiting and phone calling for you. One email to us and your appointment will be re-booked, no need for you to call the job centre plus. 7. Excellent customer service. Our agents will help you every step of the way. 8. If you are new to the UK we can help with a travel route to the location of your appointment from your home address. 9. Apply for NI number with us for a hassle free service! If you have any questions about our service then please contact us. If you have any questions about obtaining a national insurance number then plea se do not hesitate to get in touch. Disclaimer: You can apply directly at the DWP or contact Job Centre Plus. We have no affiliations with the Department for Work and Pension, Job Centre Plus or any UK government body. You may choose to apply directly by phoning the Jobcentre plus where there will be no fee payable. We cannot grant you your National Insurance Number ourselves, the decision rests solely with the HMRC. We can submit your National Insurance Number application on your behalf for a service fee.